Nearly 20 years ago, it had been veteran guitarist Carlos Santana who had the vision of the all-star collaboration album when he released his then-comeback album Supernatural. Known for bringing out the best (or at least the more aurally palatable) work from various performers ranging from Rob Thomas of MATCHBOX 20 and hip-hop singer EVERLAST, Supernatural put Santana back into the limelight with a formula of a group effort of similar-minded individuals creating a sonic universe of placid symbiotic harmony. Granted, it was impossible to escape “Smooth” anywhere on the radio during that summer of ’99 and Santana seems to be making the same album over and over since then while still being heralded as being ahead of his time. For that matter, Santana wasn’t even the first to come up with the mass collaboration idea either if one were to look overseas back then. During that same year, Tobias Sammet, singer/producer/songwriter for German power metallers EDGUY, who themselves were already enjoying similar success in Europe and elsewhere, was on the cusp of birthing his own massive concept collaboration project titled AVANTASIA. Over the course of their 20-year career, this same gig has grown from a young ambitious one-off musical exercise to a massive all-star rock opera spaceship attracting not only the biggest names in German hard rock legends such as Klaus Meine and Rudolf Schenker (SCORPIONS) but also international names such as Biff Byford (SAXON), Bruce Kulick and Eric Singer (KISS), Dee Snider and Alice Cooper among others. In fact, AVANTASIA’s work is based more so on conceptual works with vast storylines and lyrical imagery, spanning eight studio albums in its career including their upcoming opus Moonglow. And even its latest guestlist of talent on the album is, well, glowing: Hansi Kursch (BLIND GUARDIAN), Mille Petrozza (KREATOR) and even Candice Night (BLACKMORE'S NIGHT) lend their talents on this album for the first time alongside past collaborators such as Geoff Tate (OPERATION: MINDCRIME/QUEENSRYCHE), Eric Martin (MR. BIG), Ronny Atkins (PRETTY MAIDS) and Bob Catley (MAGNUM) to name a few. According to Sammet, Moonglow also follows the same conceptual pattern of questioning one’s self-existence as its predecessor Ghostlights, with the 11 individual songs on the album acting as the story of a creature finding itself in a world they can’t seem to connect with, turning instead to its darker obscure elements to find shelter there. For anyone familiar with the gothic Victorian-era writings of Arthur Machen and Algernon Blackwood, Moonglow is the concept album that best represents their work. 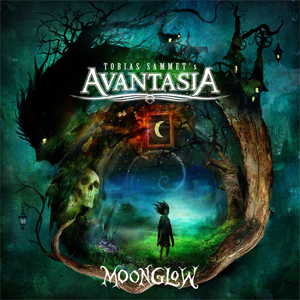 And for anyone familiar with AVANTASIA’s past works, Moonglow is also the most well-rounded album in their catalogue. Starting with the nearly 10-minute long instrumental “Ghost In The Moon”, Moonglow could almost be accused of delivering its A-game too early as the backing musical team of Sascha Paeth (guitar), Michael Rodenberg (keyboards/orchestration) and Felix Bohnke (drums) accompany Sammet to deliver a soul-melting performance. And, to be honest, few albums can sustain quite a momentum throughout its listening period when they open with a nearly ten minute long instrumental. The follow-up song “Book Of Shallows” lets the guest performers shine and shred in their element – including the unlikely inclusion of Mille Petrozza, who, generally does not come to mind when one thinks of soaring operatic metal vocals, but does a decent job alongside his contemporaries such as Hansi Kursch and Jorn Lande. Furthermore, the two lead-off singles from the album in the form of the title track (featuring Candice Night) and “The Raven Child” (featuring Kursch and Lande) are purveyors of AVANTASIA’s epic colossal sound while maintaining a modern atmospheric aura to it. Candice’s vocals on the title track showcase a more powerful range of vocal depth and rawness in parts. And while “The Raven Child” is easily the album’s longest number at over 11 minutes, Kursch and Lande are easily the perfect singers for this track as they stay the course throughout the song’s ever-changing tempo. Elsewhere, the vocal talents of Geoff Tate, Ronny Atkins, Michael Kiske, Eric Martin and Bob Catley continue to shape up AVANTASIA’s encompassing sound. Tate’s work on no less than three songs – “Invincible”, “Alchemy” and the all-star collaboration on “Piper At The Gates Of Dawn” – walk that thin line (sorry) between his past and present musical landscape. Ronny Atkins delivers some stellar vocals on “Starlight”, Bob Catley displays his symphonic vocal style on “Lavender”, Michael Kiske shows off his ever-changing vocal range with “Requiem For A Dream”, and despite his other contribution to the album being a solo rendition of Michael Sembello’s 1983 hit “Maniac”, Eric Martin puts his own mark on the Flashdance theme number, which, in other circumstances, should climax Moonglow on the most perfect note imaginable. But always eager to give the listener as much value as possible for the music he’s produced for over two decades while showcasing his own musical origins and influences, Tobias has included his own heartfelt tribute to the early works of Steve Perry-era JOURNEY through the song “Heart”, which appears as a bonus track on the album’s limited edition copy. With their upcoming world tour starting to Slovakia at the end of March and expected to hit up many of the world’s largest markets, AVANTASIA are hoping that the transition to include as many of Moonglow’s collaborators as possible on this tour becomes a relatively smooth one. And hopefully the tour finally puts the lights on the bright shining talents of Moonglow in the process.